Some third-party accessory makers are banking on a completely redesigned look for Apple's fifth-generation iPhone, though time will tell whether their projections stem from real inside information or are based on bogus rumors. For example, Case-Mate this week launched a new section of its website claiming to have "inside resources" on Apple's next iPhone. The site claimed that the fifth-generation iPhone will have a "completely different form factor" from the iPhone 4, with a design wider and thinner with an "extended home button." The page was put up to replace a previous listing with variety of different cases claimed to have been designed for Apple's fifth-generation iPhone, which were captured by Boy Genius Report, but that has since been pulled down. Like others seen before, they showed a device with curved sides, a flat back, and a mute switch moved to the right side of the handset. Case-Mate claims the so-called "iPhone 5" will have a dual-core A5 processor, an 8-megapixel camera, and "wireless charging." While the A5 processor and 8-megapixel camera are widely expected, Case-Mate's claims of wireless charging of the device make the contents of the page suspect. 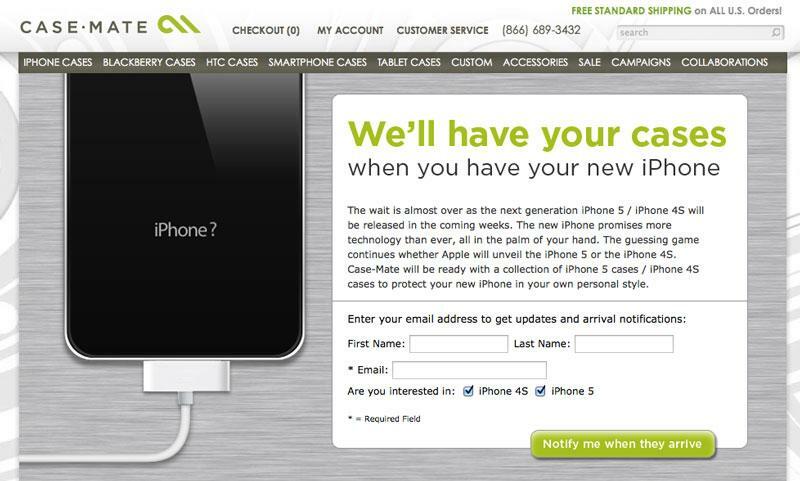 The site also claimed that its "inside resources" indicated Apple will launch both an iPhone 5 and an "iPhone 4S" in early October. The iPhone 4S was said to feature the same form factor as the iPhone 4, but with an A5 processor and 8-megapixel camera. In a similar story, new screen protectors claimed to be for Apple's fifth-generation iPhone cropped up this week at unwire.hk (via MacRumors). The accessories are designed to fit a device that is slightly larger than an iPhone 4, with a large oval-sized area where an iPhone's home button would be. The screen protectors have been seen by some as evidence that Apple plans to release a redesigned iPhone this year with a larger screen and a touch-sensitive home button, as has been rumored. However, the design could be based on alleged iPhone 5 engineering sketches released earlier this year, or could even be designed for an entirely different non-Apple smartphone with a larger display, as there is nothing on the screen protector to suggest it is meant specifically for an iPhone. Apple is expected to hold an event in the coming weeks to unveil its fifth-generation iPhone, and the handset is anticipated to go on sale in October. Rumors about the new hardware have been scattershot, with some claiming it will be a completely redesigned form factor, while others have suggested the device will look largely the same as the iPhone 4.